Welcome home Kearney Bulldogs! This is the first episode of The Coach Gray Show. In this episode Coach Gray talks about the previous weeks' game at Staley High School and preparing for the match-up at home with Platte County. Original air date 09/06/2018. What a season for the Bulldogs! This is the tenth episode of The Coach Gray Show. In this episode Coach Gray brings in Aaron Hoffman, Dakota Ah-mu, Patrick Connery and Chopper Mordecai. Thank you for allowing 102.7FM be part of an exciting season! Original air date 11/08/2018. Let's go Bulldogs! This is the ninth episode of The Coach Gray Show. In this episode Coach Gray talks about the first play-off game against the Marshall Owls and preparing for the next game against the Smithville Warriors. Original air date 11/01/2018. Let's go Bulldogs! This is the seventh episode of The Coach Gray Show. In this episode Coach Gray talks about the previous week's game against Smithville and preparing for the post-season starting this week with the match-up against the Marshall Owls. Original air date 10/25/2018. Let's go Bulldogs! This is the sixth episode of The Coach Gray Show. In this episode Coach Gray talks about the previous week's game against Raytown South and preparing for the match-up this week with Smithville. Original air date 10/18/2018. Let's go Bulldogs! This is the sixth episode of The Coach Gray Show. In this episode Coach Gray talks about the previous weeks' game against Grain Valley and preparing for the match-up this week with Raytown South. Original air date 10/11/2018. Let's go Bulldogs! This is the fifth episode of The Coach Gray Show. In this episode Coach Gray talks about the previous weeks' homecoming game against Belton and preparing for the match-up this week with Grain Valley. Original air date 10/04/2018. It's Homecoming week! This is the fourth episode of The Coach Gray Show. 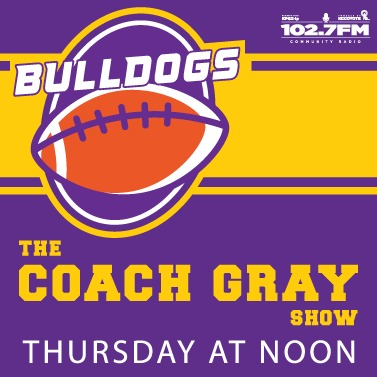 In this episode Coach Gray talks about the previous weeks' game against Grandview and preparing for the match-up this week with Belton. Original air date 09/27/2018. Welcome home Kearney Bulldogs! This is the third episode of The Coach Gray Show. In this episode Coach Gray talks about the previous weeks' game against Winnetonka and preparing for the match-up this week with Grandview. Original air date 09/20/2018. Let's go Bulldogs! This is the second episode of The Coach Gray Show. In this episode Coach Gray talks about the previous week's game against Platte County and preparing for the match-up at Winnetonka this Friday. Original air date 09/13/2018.